Pink skies, pristine waters.. A divine presence and people from all over the world. 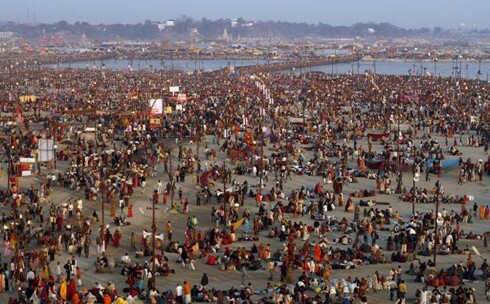 There are a plethora of reasons why the Kumbh becomes the cynosure of all eyes. It is a showcase of diversity, religion, spiritual heritage, human magnanimity and many more things. Though this is one of those 'near perfect' quotes I've been accosted by, one would wonder how Goethe left out "see new places" in his definition of a beautiful life. There are some qualities, that when cultivated, can take life to a whole new level. One such human trait, is 'a sense of occasion'. Being at the right place at the right time, most often makes all the difference between love and loss, happiness and sorrow, success and failure and as I have just realized: between a beautiful life and an ordinary one. People who generally concern themselves with trivial formalisms, consider the Kumbh Mela to be merely a religious congregation. But in reality the connotations of the Kumbh far outstretch that label. It is a culmination of human virtues, a perfect stage to re-assert and find the goodness in yourself and in others. Legend has it that when the Devas and Asuras (demons) were performing the Ksheer sagar Mathan, ambrosia emerged. Garuda (the celestial eagle) flew away with the Kumbh(pot) containing the nectar, so as to keep immortality at bay for the demons. The story goes that drops of nectar fell at the Triveni sangam, Ujjain, Nasik and Haridwar (all places fall in India). The muhurtham (auspicious time) occurs once in twelve years when the Sun God moves into the Makara rashi - which is celebrated as the Kumbh Mela from Makara Sankranthi to Maha shivaratri. The Maha Kumbh mela (which happened in 2013) however occurs once every twelve Kumbh Melas and the waters are known to be especially purifying at this time. "I have been longing to come to the Kumbh since I was 18. I have finally managed at 42. I feel blessed" says Stephen, an Ethnobiologist and a part time DJ from San Diego. His connection with the Mela is a very intimate one. There is something about me and my love for conversation. What ensued hence was a delightful yet insightful discussion on plants, the evanescence of American marriages and some 'Kumbh Mela' like festivals that happen surreptiously in the Nevada deserts. The evenings were serene yet filled with religiously suave and a festive ambience. It was so easy to merge into the devotion and meditativeness of the melodious chants during the ganga aarti. The Mela can be all what you want it to be. For the spiritualist, it is a place to feel the Lord's presence with greater ease. For the photographers, it's a one stop shop to show all what they've got. For the traveler, it's meeting like-minded people and for people from Harvard, it was a research project about urban-religious interfaces and survival semantics of ephemeral cities (these Harvard titles I tell you!). Harvard had its own camp, a lot of blonde students and a whole website dedicated to post their findings. They believed that the Kumbh mela town is an example of consummate urban planning. One wonders why the Indian government shows its muscle only when offered easy purification of sins! Their project ended with the following conclusion." The Essence of Indian urban planning is not about grand design. It's about grand adjustment". I wondered. Did it take fifty Harvard researchers thirty whole days to figure that out? No offense in-tended, but heck, I knew that when I was six. That's what they mean when they say "Ask the locals!" We are very credulous in our assumptions about differences between people across cultures. However, soak yourself up in meaningful conversations and you will realize that deep beneath the superficial vestures of skin color, language and nationality, we are all the same. Such experiences reiterate the universality in human desires and bolster your confidence in the ideology of 'Vasudaiva Kutumbakam' (The world is one family). More than purification of sins, what it will surely bring is a purification of your persona. Nothing like coupling this with a visit to the temple town of Va-ranasi. I have never been to a place before (hampi maybe an exception) which has such an ancient feel to it. There's some-thing very unique about the ghats at the ganges. At the Da-shashwamedh ghat, one offers prayers for prosperity and big success. Walk down a couple of kilometres and you are the Manikarnika ghat- where 300 dead bodies turn into ash every single day. This walk (listed by a popular website as 100 must do things in India) is so symbolic of the journey of life. We pray, we celebrate, we 'walk'...only to be reduced to ashes in 5 minutes, one fine day. The Kumbh Mela presents a strange paradox . It is the place where the 'ocean' of peace merges with the 'river' of life, creat-ing that grand highway to heaven. I went to the Kumbh. Are you going or not?